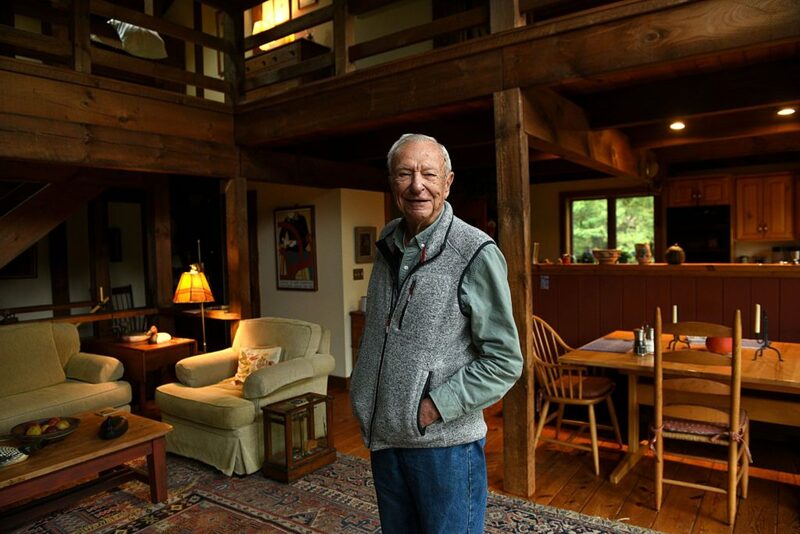 Longtime SCORE mentor Fred Thomas is photographed at his Thetford, Vt., home on Sept. 20, 2018. (Valley News - Jennifer Hauck) Copyright Valley News. May not be reprinted or used online without permission. Send requests to permission@vnews.com. 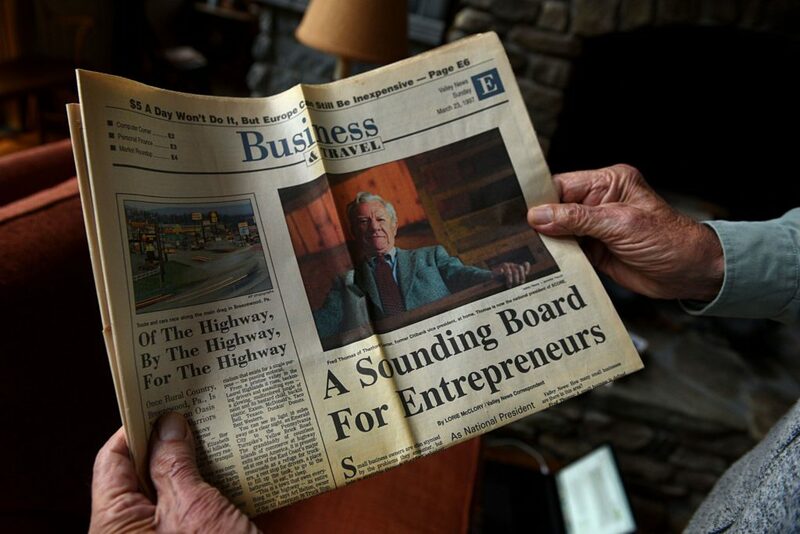 Fred Thomas, of Thetford, Vt., showed a 1997 article in the "Valley News" for his work with SCORE on Sept. 20, 2018. (Valley News - Jennifer Hauck) Copyright Valley News. May not be reprinted or used online without permission. Send requests to permission@vnews.com. 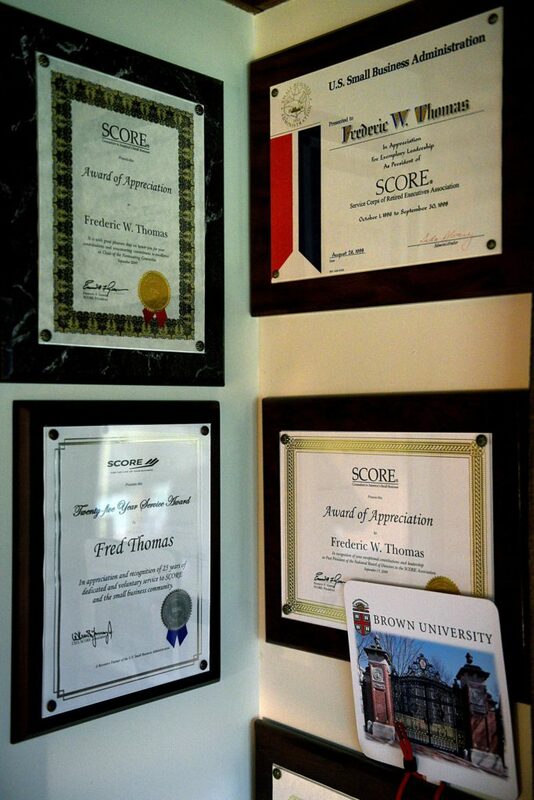 A collection of the honors and awards Fred Thomas has received for his work with SCORE is on display at his Thetford, Vt., home on Sept. 20, 2018. (Valley News - Jennifer Hauck) Copyright Valley News. May not be reprinted or used online without permission. Send requests to permission@vnews.com. When Fred Thomas recently made his way to SCORE’s Upper Valley Lebanon office for a meeting, he exited the elevator self-assuredly, with purpose and a kick in his step. He appeared to be all business. The 91-year-old Thetford resident’s stride might have been aided by a recently replaced hip, but the titanium enhancement alone is not what keeps Thomas on the go. Over the course of his life, he has consulted for entrepreneurs and executives as well as businesses and charities. Thomas also has traveled to six continents, sailed and raced thousands of miles on international waters and navigated his life with confidence and precision. His contributions to SCORE, a nonprofit association dedicated to educating entrepreneurs and helping small businesses start, grow and succeed nationwide, are just as significant. For 33 years he has generously given back, mentoring hundreds of businesses who have looked to SCORE. And no matter who Thomas advises, he has, in return, been on the receiving end of his own influences. His initiation to sailing and racing began in 1945 on the Seekonk River in Providence, R.I., when he started at Brown University. There, he competed against the likes of Harvard and the U.S. Coast Guard Academy in a Dyer Dinghy. Thomas’ passion for sailing would continue through his career, taking him around the country and, eventually, across the globe. His employment history reads like a veritable who’s who of accomplished companies: He worked as a project engineering manager at Otis Elevator Co.; did operational analysis in General Electric Co.’s aircraft nuclear propulsion department; and was a management consultant at McKinsey & Co., where he spent time in Chicago before rising to the ranks of managing partner in Melbourne, Australia. Thomas wrapped up his career in 1981 at Citibank in the international banking division as a vice president of international insurance. Thomas, along with his wife of 67 years, Marjorie, raised their three daughters: Laurie, Kathryn “Cassie” and Barbara. He regards the love the family shares as one of their greatest gifts. In 1961, the Thomas family moved to Australia. It was there that the open seas adventure and family scavenger hunts for gemstones in Victoria began. Their grown daughters went on to have prosperous careers themselves, as a teacher and school administrator, a marine biologist and a forester. “Australia was only supposed to be for a couple of years, and it resulted in seven glorious years, where I had my true introduction to the yachting world in Melbourne,” Thomas said. There, Thomas made time for another fair lady: “Salacia,” a 41-foot yacht named for the wife of Neptune, the Roman sea god. Thomas would log some 20,000 miles with Salacia, from single-handed races to international competitions, including the Rolex Sydney Hobart yacht race, a 700-mile epic. At 55 years old, Thomas retired from Citibank and the family relocated to Thetford. Yet even though he was retired, he still couldn’t stay away from the thrill of business. A friend suggested he consider getting involved in SCORE. Thomas went on to serve on SCORE’s board of directors. He later became board chairman, the nonprofit’s highest position in the country. He has helped hundreds of people and their businesses as a mentor and continues to be an important part of SCORE’s success. Thomas has helped entrepreneurs make their dreams of starting a business a reality, and in doing so, he has enhanced the livelihoods of many talented people throughout the Upper Valley. Some of the businesses and people Thomas has advised include The Center for Cartoon Studies, Veremedy Pet Hospital, and the late Lawrence Joseph “Doobie” Nowlan Jr., a sculptor who created the statuettes for ESPN’s ESPY awards and the My VH1 Music Awards. Clients have sought out SCORE and Thomas’ counsel on issues simple and complex — everything from acquisition strategies to accounting and cash flow concerns to inventory matters and seasonal hiring. Still, there are present-day issues that perplex businesses and SCORE counselors. “There are a few factors businesses have to also be willing to review and understand: ‘Why are my employees leaving? Is it for a better job (with) more money, and are they staying (in) or leaving the Upper Valley?’ They also need to address offering more flexible working options,” Thomas said. In addition to SCORE, Thomas has served the Upper Valley in a variety of board member, trustee and chairman capacities for Twin State organizations like the New Hampshire Charitable Foundation, Vital Communities, Upper Valley Land Trust and ECFiber. He also was a member of the Thetford Planning Commission and Green Mountain Economic Development Corp., served on the board and Finance Committee at Lebanon College, and was the founding chairman of Thetford Conservation Commission. Another notable in Thomas’ tales between work and family life was his 10-year association with Plan International USA, an international charity that aims to end the cycle of poverty for children. He first became involved in 1963, when he wanted to do something meaningful with an unexpected bonus he earned from McKinsey & Co. He and Marjorie became foster parents from afar, financially adopting “Nicholas” from Greece. Over the years, they would sponsor more than a dozen children living in Brazil, Colombia, Hong Kong, Indonesia, South Korea and Upper Volta, now known as Burkina Faso. Together with their own children, they enjoyed monthly correspondence from this widespread network. Thomas’ curiosity and desire to do more for Plan International resulted in his sending school supplies and clothes to the charity’s headquarters and getting acquainted with its leadership team. He established a branch office in Australia as a funding source and eventually would travel the world and help the organization grow its budget from a few hundred thousand dollars to $750 million, involving 40 donor countries and 80 receiving countries. 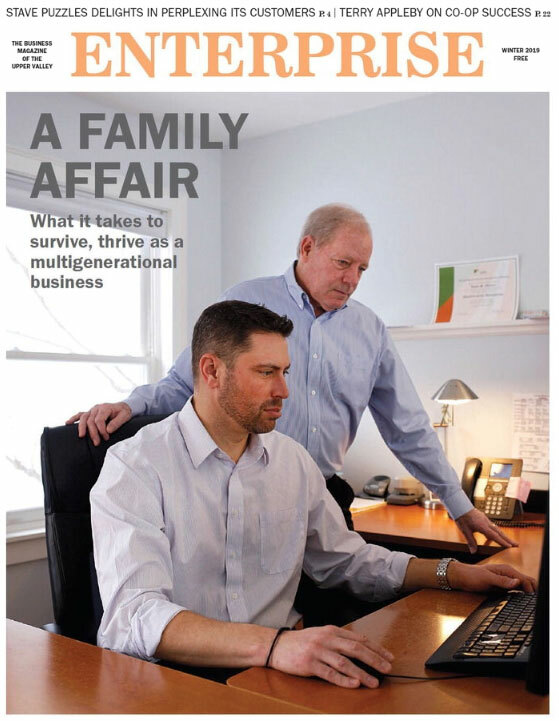 These days, Thomas continues to find enjoyment mentoring people and businesses and attending SCORE meetings. He regularly has lunches with friends to discuss business and says the networking and ongoing discussions surrounding the economy and small businesses keep him tuned in. He will gladly make time for an occasional day sail on Lake Champlain and also has taken on a new hobby: cooking and food processing. “I recently shrink-wrapped and froze 25 packets of blueberries from our garden to satisfy our (family’s) appetite for Sunday pancakes throughout the winter,” he said. He is a year-round New Englander and relishes his evenings at home on his deck in Thetford. Lynn Luczkowski has had the great pleasure to mentor with Fred Thomas and admire his contributions to SCORE’s Upper Valley chapter. She is president of L2 Communications, a full service public relations, marketing communication and social media agency in Quechee. She can be reached at Lynn@L2comm.biz.